A very special sword forged by Masataka of Osaka Province. It appears by the signature that he traveled to Shikoku (Sanuki province) to make this exquisite sword. We don’t have many examples of special ordered swords by this smith. This blade at almost 28”, is a ShinShinto masterpiece. Complete with a gorgeous carving of a Dragon chasing the pearl with Bonji on the other side all deeply cut and most attractive, The horimono is of the highest quality. 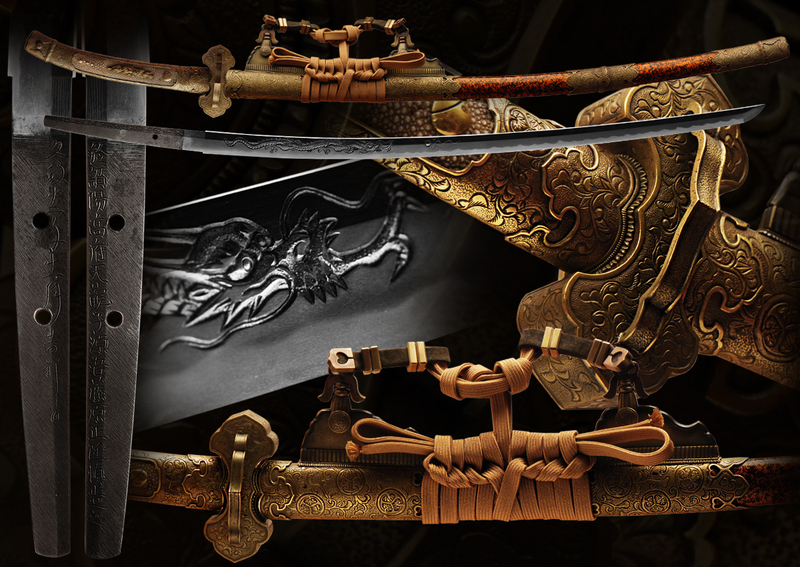 The sword is signed and dated as well as inscribed as a special order sword with title attributing the maker. 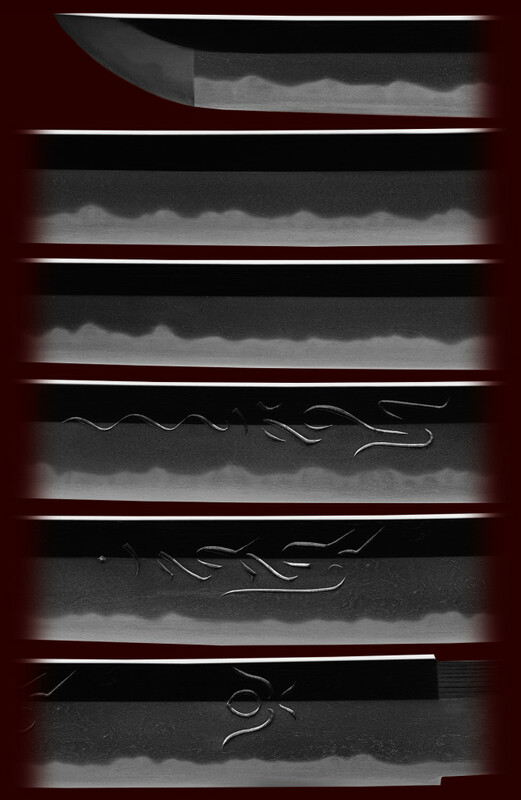 The sword forging produced a very tight itame with some mokume covered in ji-nie. The hamon is a wavy gunome choji with much activity to be seen. There is abundant sunagashi, kinsuji and a beautiful nioi –guchi. The koshirae is covered with the tokugawa mons with a floral motif highly engraved. The lacquer emulates a cherry bark design. The hangers with leather straps are exquisitely designed and a rarity to behold. These mounts are complete and are in excellent condition. 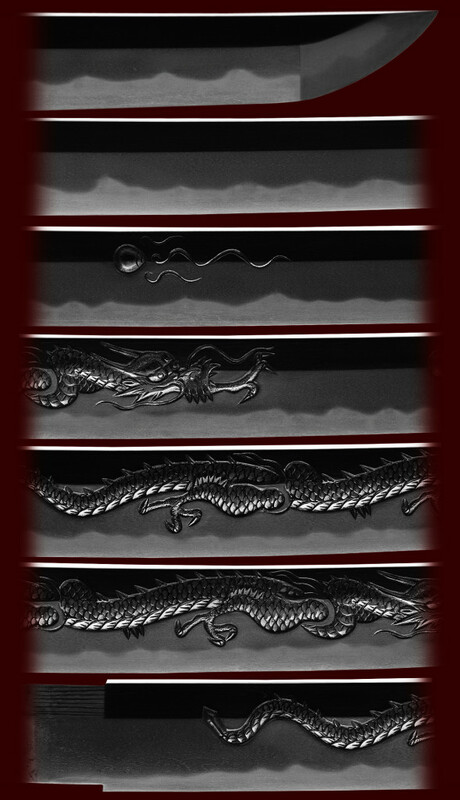 The only thing we would recommend is to have us make a new shirasaya and tsunagi to preserve the sword and mounts as is for years to come. Even though he is said to be the chakushi of Ozaki Suketaka, in actuality, he is his grandson. In the Shintô Meishûroku he is listed as the son of Tomosaburô Takashige. I think that it was erroneously transferred to sword books at a later date. He was in Settsu around Tenpô, and he later moved to Kyoto. His works are mostly kanmuri otoshi, hamon is sugu nioi shimari, excellent works are few. Efu no tachi, also called Hoso tachi, were likewise only worn by the highest ranking daimyo and officials of the court. Efu tachi have a shitogi tsuba. These are generally considered ceremonial mountings rather than combat mountings. Efu (Hoso) tachi were made from Koto through Showa times. Special order in a small Sanuki provence (Shikoku) by, title (minamoto go fujiwara) Masataka. Email us if your interested in this item and remember to include the order number for this item: fss-631.